Baking and cooking are about trying out new flavors. If you have never used cardamom in your baking before, then you should give it a try. It adds just a little spice to your cakes without being overpowering. 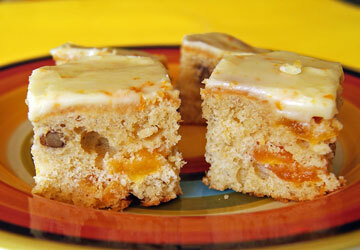 In fact by the time this apricot slice is cooked and iced, there is just the tiniest hint of spice. This particular slice is just delicious. Filled with juicy apricots and crunchy pecans, it has a soft moist texture, topped off with a tangy orange icing. The combination of flavors just seems to work. Preheat oven to moderate 180°C / 350°F. Lightly grease and line an 18 x 28 cm / 11 x 7 x 2 inch rectangular slice pan with baking paper, extending the paper for 2 cm over the two long sides. In a bowl using an electric mixer, beat the butter until it is softened. Add the sugar and cream together until the mixture lightens in color and becomes light and fluffy. Add the eggs one at a time, and beat until the eggs are incorporated. The mixture should be smooth and creamy. Sift together both the flours and the cardamom. When sifting whole-wheat flour, simply add the husks left in the sieve to the flour mixture. Chop the apricots and pecans. Fold the flour into the creamed mixture alternately with the apricots, pecans, yogurt and vanilla and stir until the ingredients are just combined. Spoon the mixture into the prepared pan and smooth over the top until level. Bake in the oven for 25 – 30 minutes until cooked. Test by inserting a skewer in the center. Remove from the oven and leave in the tin until the slice is cool enough to remove. Lift out of the pan using the overhanging paper and transfer to a wire rack to cool completely. Mix all the ingredients together in a bowl until smooth and a spreadable consistency. Spread over cooled cake.